Happy December! Today marks the beginning of the MacSanta promotion — hosted by the fine folks at Rogue Amoeba — which offers discounts on software created by independent Mac software developers. Each day, five companies (and their applications) are featured, with discounts of twenty percent off — but only for that day. If you missed that day's deals, you can still get a ten percent discount through the end of the month. Karelia Software's Sandvox will be featured in about a week; we'll be sure to mention it here just beforehand. So be sure to visit MacSantaDeals.com every day throughout December — or better yet, subscribe to the RSS feed to be automatically notified each day — to be introduced to a variety of software packages created by "indie" vendors. Most of these are demoware ("try before you buy") so you can really take them for a spin and see if they are right for you. 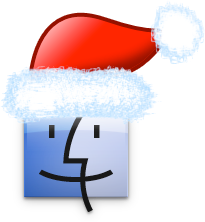 Whether or not you believe in Santa Claus, there is certainly reason to believe in MacSanta.